Travel from the historic sites of the Mughal Empire in Delhi to the banks of the holy Ganges in Varanasi on this Escorted Luxury Group Journey. Watch the sun set upon the glorious white marble domes of the famed Taj Mahal. Then head west to the deserts of Rajasthan and experience the heraldic past in the Pink City of Jaipur. Spend your nights in an opulent palace hotel and ride on elephant back to explore the Amber Fort. End your journey in vibrant, cosmopolitan Mumbai. Immerse yourself in the grandeur of the past as you explore Old Delhi's Red Fort, an opulent bastion of the Mughal Empire. Also visit Shah Jahan's incredible Jama Masjid, one of the largest mosques in the world. This evening, enjoy dinner with your fellow travelers. Get acquainted with the red sandstone tower of Qutab Minar, built to celebrate the onset of Muslim rule. Then, soak up the atmosphere at the garden tomb of Emperor Humayun and admire the imposing India Gate. Savor a local lunch and then enjoy the rest of the afternoon at leisure. Fly to the ancient city of Varanasi. Later, visit Sarnath and then continue to the banks of the River Ganges and witness the magical evening aarti ceremony. Early this morning, immerse yourself in the sacred surroundings as you enjoy a sunrise boat ride. Later, embark on a walking tour that will take you through a maze of back lanes, which exude the smells and sounds of this holy city. Visit Kachauri Gali, a lane filled with a tempting bouquet of spices, where cooks sit beside huge pans of smoking oil, balanced on earthen ovens. While exploring, you'll have the opportunity to interact with local food sellers, learn fascinating facts about Varanasi street food and sample the delicacies that Varanasi is renowned for. This morning, fly to Agra, the former capital of Hindustan. After checking in, take a tour of the palaces, mosques and audience halls of magnificent Agra Fort, a walled city built out of red sandstone in the 16th century. In this once-impregnable fortress, discover the many hidden rooms and immerse yourself in the grand legacy of the Mughals in India. 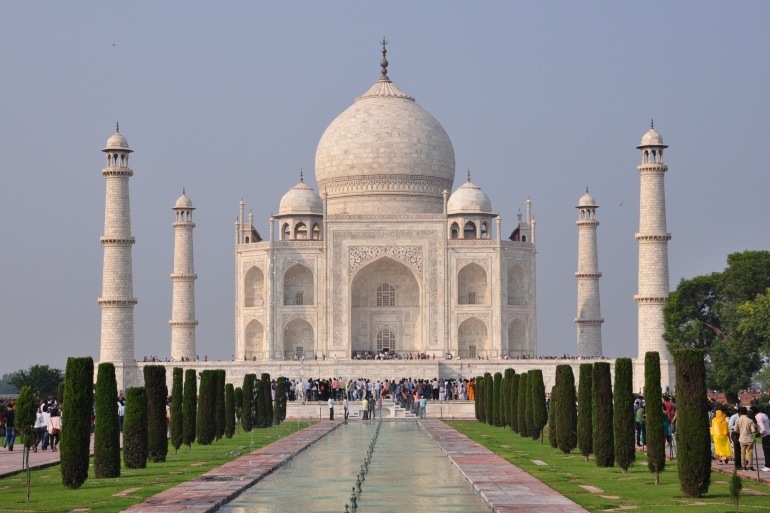 End the day with a sunset visit to the exquisite white marble mausoleum of the Taj Mahal, which Emperor Shah Jahan built as a shrine to his everlasting love for his queen, Mumtaz Mahal. Depart Agra for the Pink City of Jaipur. En route, explore Fatehpur Sikri, the enigmatic red-sandstone city built by Emperor Akbar as his capital and abandoned just 15 years later. Stop for a tasty lunch on the way. Upon arrival, take a stroll around the grounds of your palace hotel. Ride on stately elephants to the spectacular Amber Fort. From the massive ramparts of the intimidating fort, savor the breeze and look down upon the shining waters of Maota Lake and the labyrinthine, historic old city. Back in town, spend some time admiring the lovely Hawa Mahal, which provided a place where the royal ladies could watch the regal parades without being gazed upon by the commoners. Visit the City Palace Museum and marvel at its collection of Rajasthani costumes, weaponry and miniature painting before you continue to the awe-inspiring Jantar Mantar observatory. Enjoy the afternoon at leisure. Option: Enjoy an elephant safari followed by a picnic lunch. Fly to Mumbai. En route to the hotel, visit Dhobi Ghat, Banganga and a lovely Jain temple. Following check-in, continue to explore this vibrant city. Set sail to visit the spectacular sculptures of the caves on Elephanta Island. Enjoy the afternoon at leisure. Today, you will be transferred to the airport for your onward flight.